The native form of this personal name is csíkszentkirályi és krasznahorkai gróf ifjabb Andrássy Gyula. This article uses the Western name order. Count Gyula Andrássy de Csíkszentkirály et Krasznahorka the Younger (Hungarian: Ifj. 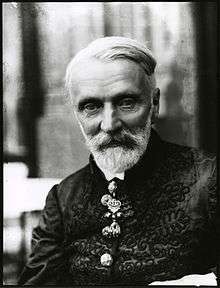 Andrássy Gyula; 30 June 1860 – 11 June 1929) was a Hungarian politician. The second son of Count Gyula Andrássy, the younger Andrássy became under-secretary in the Sándor Wekerle ministry in 1892; in 1893, he became Minister of Education, and, in June 1894, he was appointed minister in attendance on the king, retiring in 1895 with Wekerle. In 1898, with his elder brother, he left the Liberal Party but returned to it after the fall of the Bánffy ministry. In 1905, he was one of the leaders of the Coalition which brought about the fall of the Liberal Tisza ministry. In 1906 he became Minister of the Interior in the compromise Wekerle cabinet and held that office until the fall of the ministry in 1909. In 1912, he represented Austria-Hungary in the diplomatic endeavor to prevent the outbreak of the Balkan War. In 1915, he urged peacemaking and an extension of the franchise in Hungary. As Foreign Minister, in 1918, he declared the alliance with Germany dissolved and tried to conclude a separate peace. He retired from office in the same year was returned in 1920 to the National Assembly as non-partisan delegate. He subsequently became leader of the Christian National Party. He is the author of Ungarns Ausgleich mit Österreich vom Jahre 1867 (Ger. ed., Leipzig, 1897) and a work in Hungarian on the origins of the Hungarian state and constitution (Budapest, 1901). That book was translated into English and published as The Development of Hungarian Constitutional Liberty (London, 1908) His later works include Wer hat den Krieg verbrochen? Interessensolidarität des Deutschtums and Ungartums (translated by Ernest J. Euphrat and published in 1915 as "Whose Sin is the World-War?") and Diplomatie und Weltkrieg.